This magnificent addition to my eating life comes courtesy of Yasmin Othman (who has brought much deliciousness my way over the years) and I glow with gratitude every time I eat it. 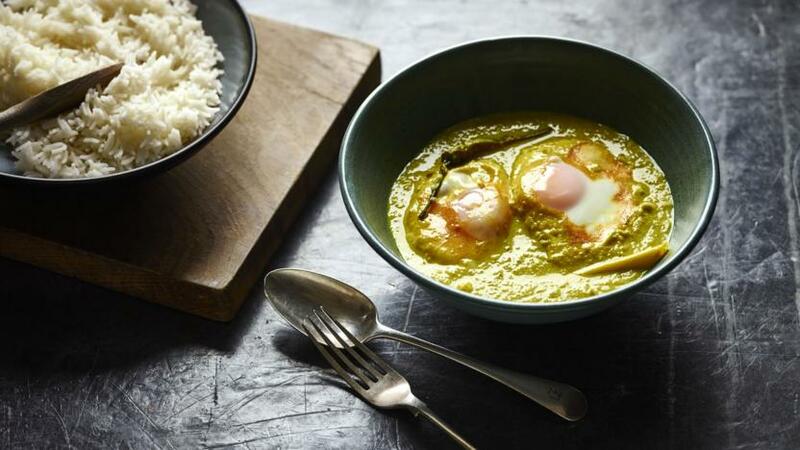 This – called masak lemak telur in Malaysian – is very far removed from the egg curries I remember from my early youth, and would much prefer to forget. What we have here are eggs poached in a rich, aromatic, turmeric-tinted, tamarind-sharp, coconutty sauce or soup. Blend the 2 green chillies and 1 roughly chopped green finger chilli, shallots, garlic, ginger and turmeric to a paste using a stick blender or mini food processor. Heat the oil in a heavy-based wok or a similar-sized pan with a lid, add the paste and the lemongrass and fry gently, stirring frequently, for 5 minutes, until the paste is cooked and softened. Add the coconut milk, salt and tamarind with 100ml/3½fl oz freshly boiled water. Make a couple of little incisions in each of the 3 whole finger chillies with the point of a small sharp knife and add to the pan. Turn the heat up to bring to a near boil, then reduce the heat and simmer gently for about 7 minutes, stirring frequently, until the sauce has cooked and reduced to a thick golden soup. Crack the eggs into the sauce, cover with a lid and leave to simmer very gently for about 4 minutes, or until the whites are set but the yolks still runny, or cook for longer if you want well-cooked yolks. Divide between two bowls, trying to spoon out most of the sauce from the pan first. Serve with rice, flatbreads or both. This has definite heat, but not eye-wateringly so. If you’d like it a bit milder, do not pierce the three whole finger chillies. And if you’d like it a lot milder, then you could de-seed the finger chilli that goes in the paste, and dispense with the whole ones in the soup. But even if, like me, you love fiery food, I don’t advise eating the whole chillies. I won’t stop you, but you have been warned.